Starting September 26 is a new weekend club for kids aged 3 to 12. The club will be held at the Kampa Community Centre on Kampa Island. 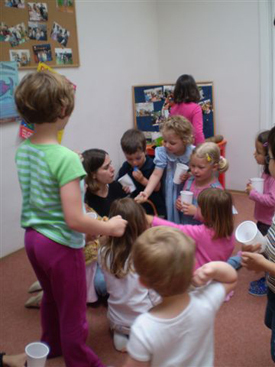 Special themed programs incorporating storytelling, puppetry, singing, drama and dance are taught in English and programs are also offered to Czech children learning English. The timing is great, the cooler months are approaching and we’re all on the hunt for extra curricular activities that will challenge and inspire our offspring - outside of the home! The Club has been organised by the experienced and talented Class Acts team so you can rest assured that your kids are in good hands, will enjoy themselves and probably learn something new. There are several different programs that have been specially created for the weekend club including classes specifically created for children learning English. Here are the program descriptions, you will find the 2009 program at the end of this entry. Storytelling with Mr Snooze includes puppets, songs, books and a craft session. Kids ‘Travel’ around the world going on an adventure to a different part of the world once a month. This is taught through dance, food, music and stories. Children are taught to accept our differences and respect other cultures. Vikend s Cookiem (Weekend with Cookie) Meet Cooking, an English speaking puppet who will teach English to Czech children through song, stories and play. This is ideal for kids who are just starting to learn English. Forest Drama Days Take part in a fairy tale adventures in the beautiful Sarka Forest with drama leaders. Create a story together, make costumes and finish by staging a show for younger kids and parents. Prices vary according to the program. Mr Snooze’s Storytime costs 100CZK per child or 200CZK for 2 children in the same family (adults and children under 2 are free). Kids’ Co costs 300CZK per child (plus materials) or 500CZK (plus materials) for 2 children in the same family. DIRECTIONS: By Metro: Take the green A line to Malostranska and walk to Kampa Island, combine metro with the tram to Újezd tram stop to be the shortest walking distance to the centre. By Tram: take numbers 12, 20 or 22 or trams 6 or 9 to Újezd tram stop.